The Boxer dog breed is best known for being a great guard dog, with a muscular body that makes it a formidable opponent for anyone. 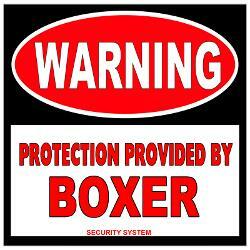 An average Boxer will live around 10 years, and a full-grown adult male should weigh between 60 and 70 pounds. If you’re buying a pure breed, look for a dog that is 25 inches high at the shoulder blades with long legs and a “pushed in” looking face. The dog should be friendly and curious when you first meet it, and should be able to greet young children appropriately. The Boxer dog is also known as the Deutscher boxer, and this comes from its roots in 19th century Germany. It comes as a result of breeding between German Mastiffs and Bulldogs and were originally created for aggressive activities like dog fighting and bull baiting. Their intelligent disposition and unique fighting style (they use their paws like a boxer, hence their name) made them a hit with circus owners in the mid nineteenth century. First introduced to America around 1900, it was officially recognized by the American Kennel Club in 1904. However, it wasn't until after the Second World War when the Boxer dog became more famous as returning soldiers took them on as companions and guard dogs. Boxers make for great family pets as they are incredibly people oriented and love nothing more than playing with humans. As with all big breeds, they will need plenty of space and plenty of exercise. This can take the form of a long daily walk or playing endless rounds of fetch in a yard. Either way, they will still need plenty of space during times when you're away, and will benefit from toys to play with to keep them stimulated. Kong balls, which are hollow mazes that you can hide food in, make for great toys for Boxers as they are reasonably dexterous with their paws. In terms of family make-up, Boxers are a very gentle breed and don't mind being pushed around by younger children actively seeking out people who will engage in a bit of rough and tumble with them. However, their size and strength means that they can knock smaller children over accidentally and can respond in a seemingly aggressive manner when they're actually intending to play. However, this tendency to jump up and greet people can be trained out of them, and the Boxer will respond well to human leadership and training. One major issue that owners of Boxers will need to consider is that of heat. Any breed that has an upturned face will find it hard to breathe in hot or humid conditions, so if you live in a place that does get this kind of weather, you'll need to make sure that there is some sort of shade in the yard as well as plenty of fresh drinking water available at all times. They also have extremely short coats, which makes looking after dog hair on your furniture easy. A short coat means that they also find it hard to regulate their own temperature in the cold, so you may find you need to buy a winter jacket for them or build a heated kennel. Boxer dogs tend not to exhibit many health problems as youngsters, but as they get older, the usual health problems of large breeds kick in, such as hip dysplasia and skin allergies. However, Boxers are also more likely to develop serious heart problems than other breeds, and it will be important to get regular check ups to get a head start on any cardiovascular disease. 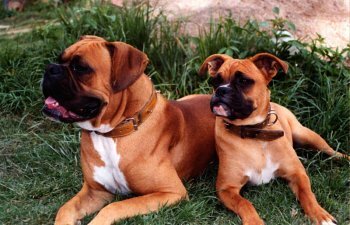 Boxers are also more prone to tumors than other dogs as they get older, and there seems to be no rhyme or reason why or when they are affected. Finally, Boxers dogs have a reputation for being deep sleepers, and they do tend to drool and snore a lot, so you'll need to make sure that the dog sleeps in a part of the house well away from human sleepers so as not to disturb anyone in the night.